"Sampath Speaking" - the thoughts of an Insurer from Thiruvallikkeni: Kadai-ezhu-vallalgal : Kolli malai Ori and the sentiments behind !! Kadai-ezhu-vallalgal : Kolli malai Ori and the sentiments behind !! Over centuries there have been Kings and Kings…. What set apart the famous from others was their great virtues of valour and benevolence. There have been some Emperors known for their - benevolence, generosity, charity, humanitarianism, bountifulness, large-heartedness, magnanimity …… Tamil literature is ripe with Kings who were greatly appreciated for their philanthropy. Those benevolent donors were called ‘Vallals” in Tamil. The Sangam era eulogies them as ‘Seven great donors’ [Ezhu vallalgal] ~ in fact there were 3 sets of them and this particular post is more about the ‘last set – popularly known as “Kadai-ezhu-vallalgal”’. Thirukovilur, famous for Sri Ulagalantha Perumal temple sung by Azhwars, is associated with vallalgal. The Kadai ezhu vallalgal were : “Thirumudi Kari, Paari, Valvil Oari, Adiyaman, Perumpeyar Began, Aai Andiran and Nalli” – the sangam literature eulogizes their philanthropic qualities. All of them were very generous, benevolent kings who felt that service to the people was their duty. The notable aspect was the avowed friendship between Kings and Scholars. Scholars advised the Kings on correct way of ruling. During this period great poets like Kapilar, Paranar, Nakkeerar, Pisirandaiyar, Avvaiyar – all flourished. The Kings respected and took great care of poets of wisdom. Agriculture, industry, crafts, trade and arts flourished during this time thus spreading prosperity all around. The Kings were concerned of the welfare of their subjects. They did not erect statues of themselves but built Temples, Forts, Dams and more for the wellbeing of their kingdom. Pari, the vallar is perhaps most read about. He acquired fame by leaving his chariot to allow the ‘mullai’ creeper to grow. "முல்லைக்கு தேர் கொடுத்தான் பாரி" . He had two daughters by name - Angavai and Sangavai - who were also very good in literature and poetry. They are referred in Purananuru also. Quite unfortunate that in the supposedly comic scene “Vaanga Pazhagalam” Solomon Pappaiah introduces Sivaji to his daughters using not so decent language and those two daughters who are shown as black and somewhat ugly are named ‘Angavai and Sangavai’… Vivek’s dialogues are replete with vulgarity and do not befit the scene. Then there was Ori - கொல்லிமலையை ஆண்ட, கொடைவள்ளல் ஓரி. Kolli Hills are featured in several works of classical Tamil literature such as Silappathigaram, Manimekalai, Purananuru andAinkurnuru. The King of Kolli, Ori’s valour and marksmanship are sung by several poets, and his exploits are a popular part of folklore. Ori is said to have killed a lion, bear, deer and a boar with a single arrow. Wikipedia notes that Valvil Ori was a Vettua Gounder who ruled over the Kolli Hills in Tamil Nadu, around 200 CE and is regarded as one of the greatest archers the country. The district administration has been conducting the Valvil Ori festival, flower expo and tourist vizha at Kolli Hills in August. Cultural programmes, folk dances, dramas highlighting the life of Valvil Ori and programmes by school children are to be held ~ and here is something read in Indian Express of date. Any government function would have a multitude of leaders and cadre of the ruling party swarming the venue. But in contrast, the Valvil Ori festivities held at Semmedu atop the Kolli hills are bereft of political leaders, particularly State ministers and their supporters. It is quite common for political leaders, including State ministers and members of Parliament and the Legislative Assembly, to stay away from the hills for fear of a myth of losing their office once they participate in this festival, which is held every year. It looks like a lasting myth that Ori, the ancient king, may spell trouble to those in power. 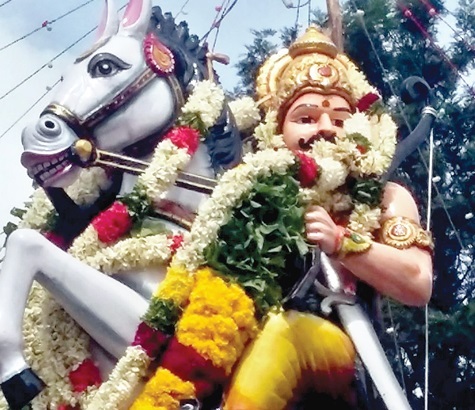 The report in Express reads that “It has become a strong belief over the years that political leaders or bureaucrats would lose their position if they garland the Ori statue or attend the festivities coinciding with Aadi Perukku” said an official who had served at the hills. Certain incidents that took place in the past seem to have lent credence to it. DMK chief Karunanidhi went out of power when his government was dismissed in 1976, after he visited the hills and honoured the ancient king. Late DMK veteran Veerapandi Arumugam also lost key portfolio in 1990, a tribesman recalled. Invitations for the festival would have the names of State ministers and legislators in bold letters, but they seldom attend the event. This year too, State ministers chose to stay away. The fear of Valvil Ori even made new Collector M Asia Mariam to stay away. On Monday, she chose to keep herself busy with the routine public grievance day programme at the Collectorate. Officials said the Collector had to attend the grievance day event as it was her first day in office after taking charge on Sunday, a holiday. District Revenue Officer K Palanisamy declared open the festival. The only face of a prominent politician seen at the function was C Chandrasekaran, MLA of Senthamangalam Assembly segment. Since he is a tribesman, be was brave enough to be present. More often, the privilege of garlanding the idol of Valvil Ori goes to low level staff of the Rural Development Department. This time, office assistants — P Venkatachalam and K Kandasamy — and Murugesan, manager of a government-run cottage, garlanded the Ori statue at the break of dawn. Revenue Divisional Officer M Kannan also garlanded the statue. ~ that is rationalism !! Photo and news credit : The Indian Express.